Events – What’s Happening at Sail Dallas! Our sailing curriculum is designed to develop competent sailors and is broken down into manageable steps. Start by developing a sound foundation. Then add to your skills by taking our short, targeted Intermediate Sailing Seminars. You can not become a competent sailor overnight (beware of any claims to the contrary). Earn your ASA 101 Basic Keelboat Sailing Certification over two weekends. Schedule conflicts? Don’t worry, call us, we can usually accommodate your schedule at no additional charge. Learn the Basics of Sailing. 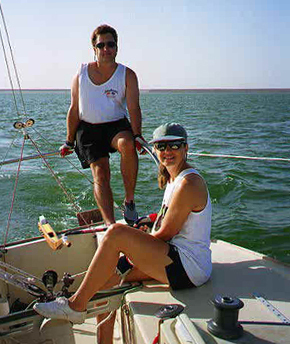 This ASA 101 Basic Keelboat Sailing course is taught to the ASA standard. For details on getting started, scheduling, and pricing, click here. Upon successfully completing the course above, you are now qualified to rent/lease our J/24’s and GO SAILING! After you have been sailing a little and geting comfortable with the basics, it’s time to add to your sailing skills. We offer several Intermediate Sailing Seminars (i.e. Heavy Air Sailing, Sail Trim, Boat Handling, Spinnaker Sailing, etc…). Sooner or later, you may want to purchase your own sailboat. That may be today, next month, or perhaps next year. Whenever that time comes, we are there to help ensure you get the sailboat that is right for you. Our yacht sales (Sea Lake Yacht Sales) is a Beneteau Dealer offering both new and pre-owned sailboats ranging from 30ft to over 70ft. Additionally we are the largest yacht brokerage in the state of Texas with a large selection of pre-owned sailboats of all makes & sizes. …Already know how to sail? If you already know how to sail or already have your ASA 101 Certification, we invite you to rent/lease our J/24’s, sail with us, and develop your sailing skills! Call us at 214-215-SAIL (7245) to discuss your options.